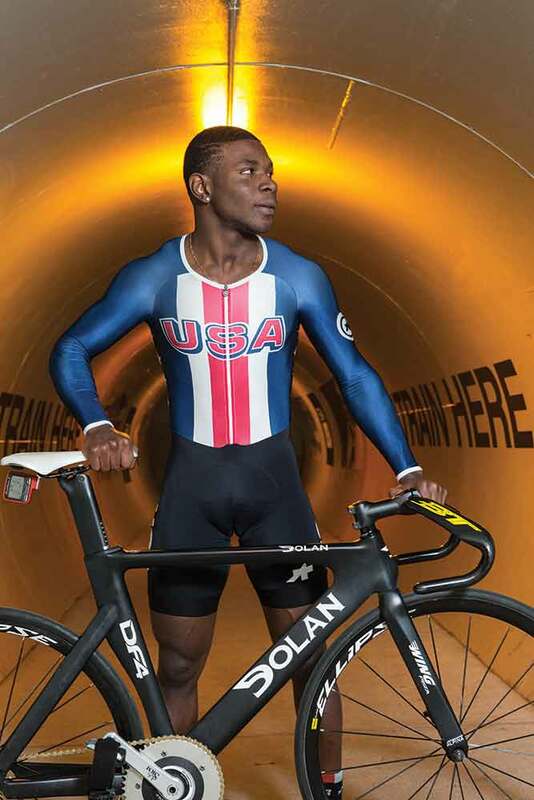 Joshua Hartman overcomes severe injuries and cycling's socioeconomic hurdles to become one of America’s next best track sprinters. There are days when Josh Hartman envisions his life without cycling. He would likely still live in Brooklyn’s East New York neighborhood, far beyond the borough’s creeping wave of gentrification. Perhaps he would string electrical wire, like his father, or attend a junior college like his high school classmates. Or perhaps his life would have followed a different path altogether. He might sell drugs, like some of his childhood friends, or sit in a jail cell. Hartman isn’t in jail on this chilly December afternoon; he’s in Colorado Springs in a rented house on the east side of town. Cycling brought him here. Hartman is the newest member of USA Cycling’s Olympic development squad for velodrome racing, and if he maintains his current trajectory, he will compete in the 2020 summer games in Tokyo and perhaps multiple Olympics beyond. The house sits just three blocks from the U.S. Olympic training center and velodrome. Every weekday Hartman rides down to the training center to lift weights and perform plyometric exercises; he spends another one to two hours in the velodrome, spinning laps around its 333.3-meter oval. In his off-time Hartman takes classes at the local community college and sleeps. It’s hardly the preferred lifestyle for the average 19-year-old male, yet Hartman says it’s the perfect situation for him at this point in his life. “Real people have a 9-5, they work a double shift and struggle to live. I get to live in play-land,” Hartman says. Should Hartman qualify for the 2020 U.S. Olympic team, he will pen another chapter to an already improbable story. Cycling is Hartman’s passion, and he has pursued it on his own, often without the blessing of his parents. It’s a passion that nearly killed him; in 2013 he crashed hard on his face and spent two weeks in a coma. And then there are the invisible hurdles that have stood in Hartman’s way since he first turned a pedal stroke. It’s no secret that cycling in America has become a sport for the affluent, those with six-figure incomes who can afford expensive gear and racing fees. It is a sport where the pro and amateur peloton is overwhelmingly white and born with privilege. Hartman is the first-generation American scion of immigrants from Guyana. He is black. He grew up in a working class neighborhood famous for producing mobsters and boxers; gangster Henry Hill and Mike Tyson both came from the neighboring Brownsville neighborhood. In East New York, 34 percent of the population lives below the poverty line. 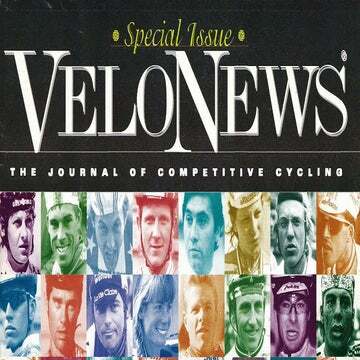 Throughout his short cycling career, Hartman repeatedly crossed cycling’s socioeconomic barriers with the help of his friends from New York City’s cycling community. These amateur riders, coaches, and teammates helped finance Hartman’s progression through the sport; they also imparted wisdom and motivation to help Hartman overcome his toughest moments. Now, Hartman straddles two disparate worlds: the cycling world, and the world of East New York. Along his life’s journey, he’s learned to embrace his individuality. NEW YORK CITY’S AMATEUR racing scene is a melting pot of ethnic groups and nationalities, and no borough better reflects this than Brooklyn, where weekly series take place at Prospect Park and Floyd Bennett airfield. In eastern Brooklyn, riders from Jamaica, Guadeloupe, Suriname, and Guyana fill out the local teams. One of the scene’s local heroes is Randolph Toussaint, 62, who raced for Guyana at the 1984 Olympics. One day in 2010, Toussaint sat down to have a talk with Hartman at the behest of his grandmother. The boy was in need of activities outside of school, she said. Touissant put 12-year-old Joshua Hartman on an old mountain bike and took him for a ride in Prospect Park. Toussaint says young Joshua was a natural on the bike. Touissant and his friends assembled a road bicycle for Hartman from spare parts. Hartman loved the freedom and challenge of cycling, and was immediately hooked. While other kids from his neighborhood played video games or hung out after school, Hartman rode around Prospect Park’s three-mile loop for hours. Hartman needed riding mentorship, so Touissant introduced him to riders from the Major Taylor/Iron Riders cycling club. The New York City club is named for the early 1900s African American world track cycling champion and the predominantly black Army infantry division that traversed the American west on bicycles. It is open to riders of all backgrounds and abilities, yet it is predominantly comprised of African American professionals who ride for fun. The club welcomed Hartman onto its racing development team, and paid his entry fees and travel costs for local events in Brooklyn. After just a few months on the bike, Hartman began to win junior events at Floyd Bennett and Prospect Park. The victories gave him confidence, and bolstered his self-identity in the sport. At some point, he earned a nickname amongst riders on the development team. In the club, Hartman also found a new social group comprised of adult mentors; its membership includes lawyers, doctors, and businesspeople. They talked to Hartman about careers and culture, and gave him an outlet away from his peers at school. By the time he was 15, Hartman says his childhood friends from East New York were already joining gangs and falling into trouble. 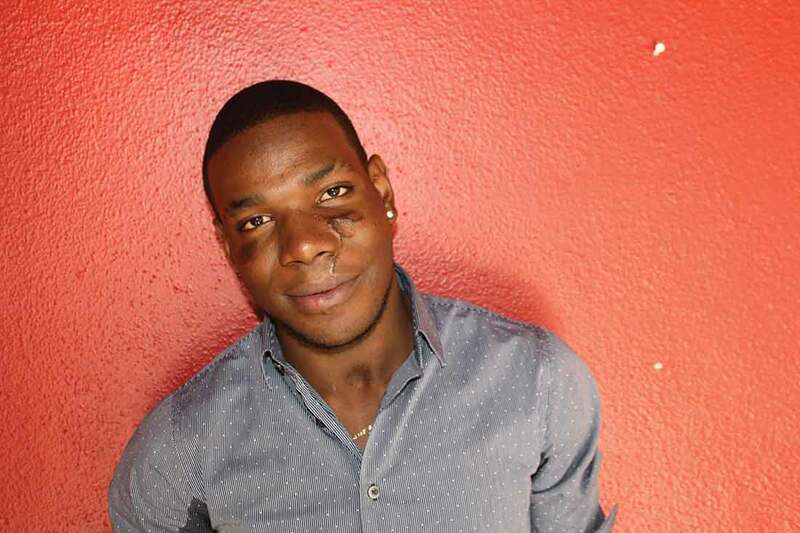 He witnessed a shooting on his way home from school one day; another day, a police officer pushed him up against a chain-link fence, mistaking him for the instigator of a fight. Riding, however, brought a danger of its own. The defining moment of Hartman’s early life came on the afternoon of June 8, 2013, at the Red Hook Criterium race at Brooklyn’s Navy Yards. As Hartman sprinted around the twisting track in his qualifying round, he struck his pedal on the pavement, and the impact flung him off of the bicycle. Hartman crashed face first into the foot of the race’s barriers. The metal bar pierced the skin of his cheek and shattered the bones underneath. Blood poured from Hartman’s facial wounds, and in the first moments after the wreck he nearly asphyxiated. Emergency personnel cut into his trachea to insert a breathing tube, which saved his life. They rushed Hartman to Brooklyn Hospital, where surgeons pieced his face together with metal plates and 23 screws. He spent the next two weeks unconscious, kept alive by a ventilator. As the reality of Hartman’s tragedy set in, Miller says club members understood what the crash meant for Hartman. THE DARK SCAR FROM Hartman’s crash still stretches from his nose across his left cheek and down to his lips. Doctors have volunteered to remove it from Hartman’s face, but he has decided to keep it, for now anyway. When Hartman finally regained consciousness, his recovery began with multiple surgeries and painful dental procedures. He lived in constant pain; simply turning on the lights made him dizzy. He was moved to Kings County Hospital in neighboring East Flatbush. For three days he shared the room with a gunshot victim. On day four, the victim died. Outside the hospital, the cycling world rallied to Hartman’s aid. His family had medical insurance, and the race’s event insurance had limited coverage for participants. Tonya Miller still feared the avalanche of medical costs that were bound to hit Hartman and his family, and launched a donation page on the website GoFundMe.com. Donations poured in from club members at first, then from cyclists throughout greater New York City, and eventually, from cyclists across the globe. When Miller’s efforts were over, she had raised nearly $50,000 for Hartman’s bills — the sum eventually covered the lion’s share of the cost. The fund drive also caught the attention of media; stories about Hartman’s crash and recovery appeared in The Wall Street Journal and on the New York news website Gothamist.com. Hartman left the hospital three months after his crash. Doctors forbade him from riding; his jaw was wired shut, and his weakened facial bones could not survive another crash. He went back to school, but he was painfully behind the other students. He had missed the ninth grade New York State Regent’s Examination, which is a prerequisite to graduate. Following the advice of his parents, he enrolled in Brooklyn Automotive High School, a public school that teaches kids to be auto mechanics. His life at home was also strained. Hartman’s parents were terrified by what had happened to their son. Prior to the wreck, they had not understood Hartman’s passion for cycling, he says. After it, they tried to steer him away from anything related to cycling. Hartman’s father pushed him toward education, or finding a job. Friends from the Major Taylor club invited him to social functions and doled out help anyway they could. Teammates paid for a tutor to help him with mathematics and reading. They also helped him secure internships and work. He worked one summer at an auto garage and disliked it, so the following summer he pursued an internship with a club member who worked as a computer tech. Miller, who worked for an entertainment agency, even took him to New York Fashion Week. Miller said the team wanted to show Hartman that a professional life existed for him, beyond his trade school. WHAT PERCENTAGE OF THE U.S. peloton is African American or Hispanic? Nobody can say for sure. USA Cycling surveys its membership by gender, age, and income level, but not ethnic background. The cycling industry at large has produced a handful of studies on overall bicycle usage — metrics that include commuters and casual riders — to determine demographics: a 2010 study by the National Sporting Goods Association determined that five percent of adult cyclists are African American, and six percent are Hispanic. Other studies paint a more positive picture. A 2010 study conducted by the Outdoor Foundation found that road, mountain, and BMX biking was the second-most popular outdoor activity for Asian/Pacific Islanders and Hispanics (14 percent of respondents) and third most popular for African Americans (10 percent). And a 2009 study referenced by the League of American Bicyclists said that the total number of bicycle trips for African Americans, Asian Americans, and Hispanics grew from 16 percent to 23 percent from 2006 to 2010. Still, anecdotal evidence even in cycling’s hotbeds of diversity point to a domestic peloton dominated by Anglo Americans. 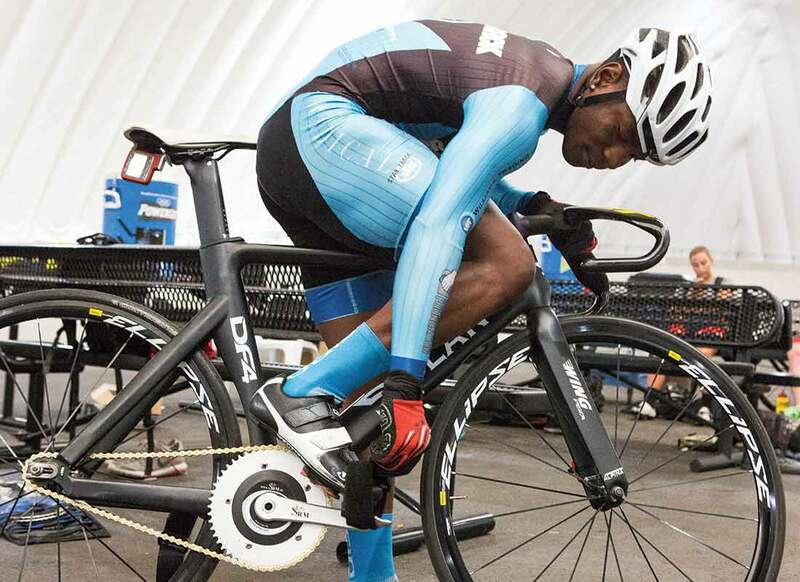 American cycling has produced few African American Olympians: Major Taylor and Nelson Vails are the most famous; sprinter Giddeon Massie is the most recent. 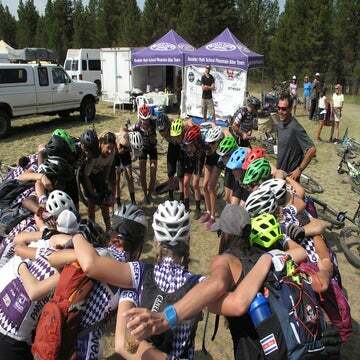 Tolman and others believe that a key to diversifying the sport of cycling exists in youth development programs that help young cyclists overcome the financial burden associated with the sport. In Detroit, the BikeVon nonprofit attracts children from the city’s predominantly black and Hispanic neighborhoods for after-school cycling sessions, where the bike, helmet, and mentors are provided free of cost. Kids can also race on Detroit’s velodrome at Bloomer Park as part of the program. In New York City, the cycling nonprofit Star Track supports a similar model at the Kissena velodrome in Queens. Founded by Irish Olympic track racer Deirdre Murphy Bader, the program provides bikes, helmets, and coaching for young riders, free of charge. The program does not explicitly work with minorities, however the 120 participants are largely African American, Asian American, and Hispanic. Hartman was one of Star Track’s all-star riders before his crash. He had joined the program in 2013, around the time he joined Major Taylor, and he quickly became a standout racer. He was the ideal kid for the program; he was dedicated and physically gifted, and in need of the financial assistance to ride and race. Like the members of the Major Taylor team, the coaches at Star Track took Josh under their wings to show him the nuances of the sport. In the months after his crash, Hartman ventured back to the Kissena velodrome to see the Star Track coaches and riders. He missed the community, and asked the director if he could come on as a coach. Star Track happily hired Josh, and he worked with the younger kids, helping them adjust to the fixed-gear bikes. Taylor recognized that something was wrong with Hartman, beyond the obvious health challenges posed by his recovery. By early 2015 Hartman had moved out of his parents’ house and was living with his grandmother — the result of disagreeing about his life goals, he says. He was back riding his bicycle for hours on end in Prospect Park, but he rarely raced in road races, fearing crashes and injury. Friends worried that he lacked a specific goal in life. Taylor reached out to Hartman, regularly inviting him to spend time with his family. Hartman became friends with Taylor’s son, Billy, and began spending time at the family’s apartment in Manhattan’s east side. By that spring, Hartman had moved in with the Taylor family. He accompanied the family on trips to Trexlertown, Pennsylvania, to watch Billy race at the Valley Preferred Cycling Center. During that time, coach Taylor encouraged Hartman to pursue racing again. If road racing presented too many opportunities to crash, then why not race on the track? On a whim, Hartman participated in a track race at Trexlertown in May of 2016. He finished fourth overall. He was hooked. HARTMAN IS NOT AMERICA’S best track sprinter — not yet, anyway. He still lacks the raw power to accelerate alongside the country’s Olympic racers. But Hartman can propel a track bike from a dead stop to top-speed faster than almost anyone in the country. It’s a violent, somewhat awkward effort that requires Hartman to wrench his body forward on the bicycle while simultaneously stomping his legs on the pedals. The skill makes him the optimal lead rider for the team sprint competition, in which a team of three cyclists complete three laps of the velodrome after starting from a standstill. The lead rider requires brute strength, as well as a willingness to load his leg muscles and connective tissue with the maximum stress in the shortest amount of time. 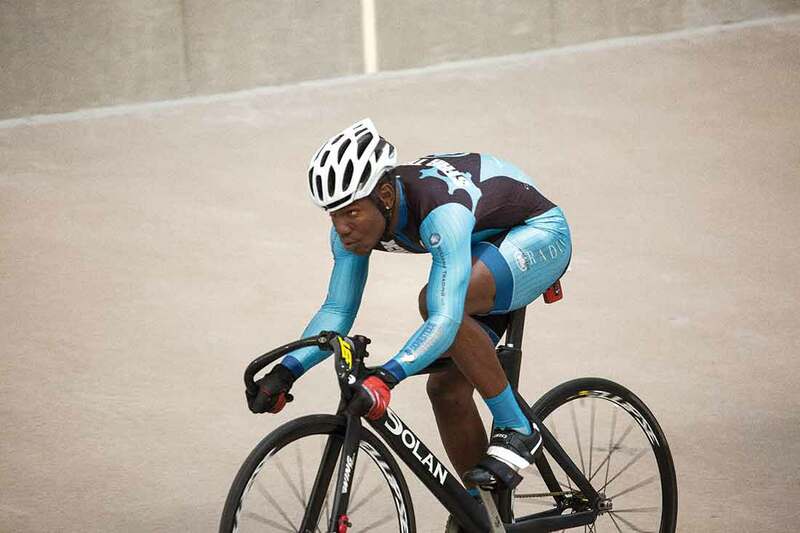 The skill helped Hartman excel in sprint competitions soon after he returned to racing; by the summer of 2016 he qualified for USA Cycling’s junior national championships at the Trexlertown track. The three-day meet transformed Hartman from a virtual unknown into a rising star. 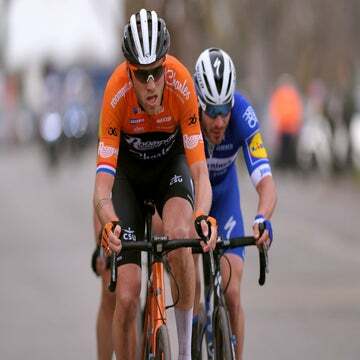 In the match sprint, he handily defeated riders with national experience in the early rounds, eventually finishing second place overall. He collected another silver medal in the Keirin and a bronze in the team sprint. The results put him on USA Cycling’s radar. In August he participated in the Junior Pan-American games, and in late 2016 he was invited to train at the Colorado Springs complex with the Olympic coaches. Hartman was overjoyed at the opportunity, yet he knew the step would require a lengthy conversation with his father. In November, the two met to talk about Hartman’s future. The trip to Colorado transformed into a long-term stay with the Olympic training program. The experience was beyond what Hartman could afford by himself. Taylor stepped in to help fund Hartman’s Olympic development. The Major Taylor team also chips in, regularly sending him cash for shoes, food, and other day-to-day purchases. Beyond the financial assistance, Hartman’s friends from cycling also talk to him about his newfound spot in the sport. Like the other riders in any given race, Hartman has talent and a desire to win. Yet everything else about Hartman — his background, his ethnicity, and even his path to the sport — is different. That’s where Hartman finds himself on this December afternoon. Soon, he will head home for a holiday break to see friends and family. He is eager to tell his father about his training; his dad is now proud of his progress, Hartman says. Then, he will return to the house in Colorado Springs. He lives at this house with his two track teammates, Dominic Suozzi and Joe Christiansen. Christiansen hails from Lyons, Colorado, where he was a standout on the high school cycling team, and traveled to Europe to race with the national team. Christiansen teases Hartman about a recent training session; Hartman has developed a reputation for pushing himself to the point of vomiting. Hartman laughs and then teases Christiansen back. In the moment, thoughts of East New York, the crash, and Hartman’s recovery melt away. Hartman is another hopeful Olympian, working toward greatness. He’s well on his way.